The mission of corps cyclist battalions was similar to that of the divisional cyclist companies. Divisional cyclist companies had been designed to relieve divisional cavalry squadrons of those reconnaissance and security duties that did not require the employment of skilled horsemen. These included patrols in areas that were well provided with roads, and missions that involved a great deal of dismounted work. 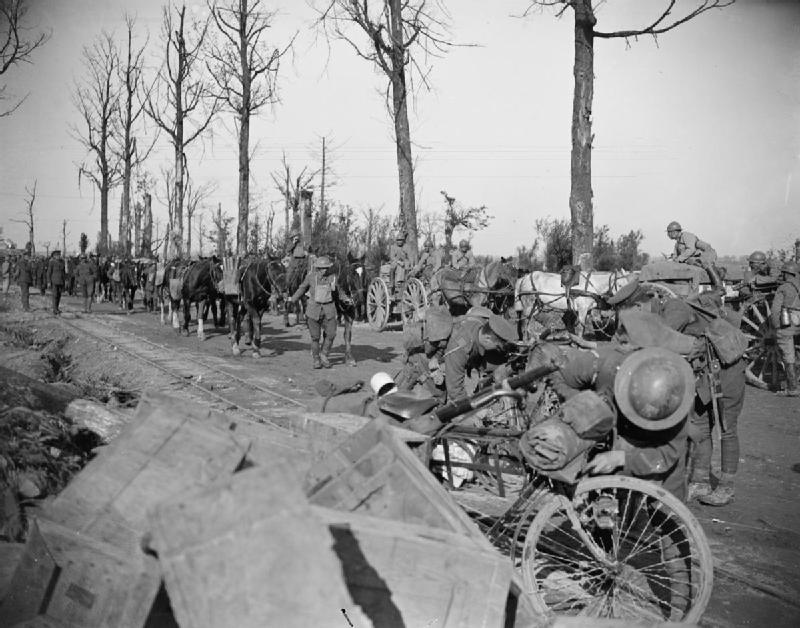 While all British cavalrymen of World War I were trained to fight on foot as well as on horseback, the act of dismounting deprived a cavalry unit of the services of the men detailed to care for the horses. As one man could only manage four horses or so, the transition from saddle to boot cost a cavalry unit some 25 per cent of its rifle strength. A cyclist unit, however, did not have to worry about its mounts running off on their own accord or being hit by stray small-arms fire. It could thus put everyone of its rifles into the firing line. Cyclist battalions were relatively small units, with an authorized strength of some 322 officers and men. (A contemporary infantry battalion had an authorized strength of 999 officers and men.) The three companies of each cyclist battalion were, at 98 officers and men, likewise much smaller than either British infantry companies of the day (229 officers and men) or the standard divisional cyclist companies of the first two years of the war (204 officers and men). Because of this, the formation of corps cyclist battalions created a surplus of unassigned men. A few of these found jobs in the headquarters of the new corps cyclist battalions. Most, however, were sent to other units, with a considerable number ending up in military police units and trench mortar batteries. The standard building block of both divisional cyclist companies and the cyclist companies of corps cyclist battalions was the 31-man cyclist platoon. (A divisional cyclist company had six such platoons. A cyclist company of a corps cyclist battalion had three.) Each of these platoons consisted of a small headquarters and four sections. The headquarters was made up of the platoon commander (a lieutenant or second lieutenant), a sergeant and a batman. Each section consisted of a section leader (who usually ranked as either a corporal or a lance-corporal) and six men. As long as the Expeditionary Force was locked in positional warfare, most of the reconnaissance and security work carried out on the ground was performed by patrols provided by infantry battalions. As a result, cyclist units spent the middle years of the war in much the same way as their comrades in the divisional cavalry squadrons and the corps cavalry regiments. They trained for the resumption of mobile warfare; patrolled the roads, woods and fields behind the front lines; escorted prisoners of war; and provided working parties for various fatigues and engineering projects.